Humanitarian aid worker Gia Andrews chases disasters around the globe for a living. It's the perfect lifestyle to keep her far away from her own personal ground zero. Sixteen years ago, Gia's father was imprisoned for brutally killing her stepmother. Now he's come home to die of cancer, and she's responsible for his care—and coming to terms with his guilt. Gia reluctantly resumes the role of daughter to the town's most infamous murderer, a part complete with protesters on the lawn and death threats that are turning tragedy into front-page news. Returning to life in small-town Tennessee involves rebuilding relationships that distance and turmoil have strained, though finding an emotional anchor in the attractive hometown bartender is certainly helping Gia cope. It takes more than one person to make a lie - one to say it, and another to believe it. The cover is what drew me to this book, are you noticing a trend here? Nothing like a gorgeous cover to grab ones attention. I love the back view, looking out at the world, there is something mystical about it. She is pondering life, her future and a past that she isn't sure she wants to revisit but resigns herself to the fact that she must. This is Gia, she is heading back home to face her father, a convicted murderer. Kimberly Belle's debut shows a new talent on the horizon. Beginning with that very first chapter I was hooked. I was drawn into Gia's world in a way that had me connecting with each of the characters here, Not just Gia but her sister and brother also, how they coped (or didn't cope) with the horrific act that happened 16 years ago. I really liked the layout of this book. Told in present day but then jumping back to the past to get glimpses of what actually took place before that fateful night. There is much going on in this book, it's suspenseful, mysterious and emotional. How that one act of violence can affect the lives in this small town was played out nicely. The ending was brilliant, lots of twists and turns that had me guessing right till the final page. My point is I was too busy running to notice that no one was behind me. The only person chasing me was myself. A solid debut, looking forward to what Kimberly Belle has to offer in the future. Thanks so much for a lovely review!! 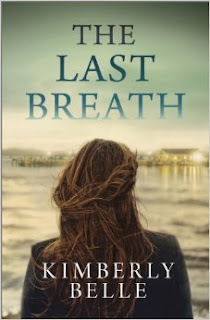 I'm thrilled you liked The Last Breath!